This course is intended to acquaint the student with the basic skills of bowling. These include, but are not limited to, the basic mechanics of good bowling form; ball selection; stance, approach, and delivery of the ball; how to analyze your delivery and make appropriate adjustments; the importance of concentration, both mental and visual; the "mental game"; score keeping; bowling terminology; and, lane courtesy. *Execute and analyze effective bowling form and ball delivery. *Roll the ball directly over the appropriate target arrow on the bowling lane at least 55% of the time, 11 out of 20 attempts. *Correctly identify form and delivery problems and make appropriate corrections..
*Know how to correctly score a complete game of bowling. *Name and understand the basic components of an effective ball delivery, including the stance, approach, ball swing, and follow through. *Establish an effective, consistent start position and determine the single best target arrow for his/her strike ball. *Understand and customize the 3-6-9 Method for spare attempts. *How to correctly determine a bowler's handicap for scoring purposes. *Note: To receive an A or A- grade in this class the student must be able to hit the appropriate target arrow 11 out of 20 attempts, 55% success minimum. WEEK 1 Course overview & grading; discuss & demonstrate the 4-step delivery; discuss & practice a strike ball delivery; Strike Ball handout(10 points). Review previous session; how to keep score; bowl for score; Scoring Bowling handout (10 points). WEEK 3 Figuring Handicap handout (10 points); Grading Summary handout; bowl for score. Grading Quiz (10 points); Review adjustments; Adjustments I Made Today handout (10 points); bowl for score. WEEK 4 Bowling league teams sign up; bowl for score. Written Quiz (10 points); bowl for score. WEEK 5 Bowl for score. Mid Term Exam (20 points), bowl for score. WEEK 7 League Play; adjust handicap. *Quizzes, 10 points each: 30 point total. *Mid Term Exam: 20 points. *Final Exam: points: 20 points. Students must have an ONID account in order to access their grade at the campus Blackboard site. To get an ONID account, go to http://www.onid.orst.edu Once the student has logged into Blackboard, access this class. If you cannot access the course, you are not correctly registered for this class. Again, you must have an ONID account in order to access your final grade. Oregon State University provides clear definition and sanctions for academic dishonesty. As a result, academic dishonesty of any kind is not tolerated. Students caught cheating, plagiarizing, or participating in any form of academic dishonesty will receive an F on the assignment or test (and possibly an F in the course). A formal report to the chair of the Department, to the Dean, and to the Student Conduct Program will be made. Statement of Risk: Risk is associated with many of life’s activities, including PAC classes. It is highly recommended that you provide yourself with a student health/accident insurance policy. These are available through the University, private carriers, or through a family policy. If uninsured, minor accidents or health problems can lead to great expense. If you have a condition that might affect or be affected by participation in this PAC class, you are encouraged to so inform your instructor either verbally or in writing. Should you become ill or injured during class time, please inform the instructor or have a fellow student do so. If you must leave class because of illness or injury it is recommended that another student accompany you. Heavy bowling balls and ball return machines used during this class have an obvious inherent danger. Use common sense and precautions at all times. When bowling, common sense and precautions are urged at all times. If you perceive dangerous conditions that cannot be counteracted with common sense and reasonable precautions, desist and/or speak with your instructor. Accommodations are collaborative efforts between students, faculty and Services for Students with Disabilities (SSD). Students with accommodations approved through SSD are responsible for contacting the faculty member in charge of the course prior to or during the first week of the term to discuss accommodations. Students who believe they are eligible for accommodations but who have not yet obtained approval through SSD should contact SSD immediately at 737-4098. *Assuming you do not have a proven stance starting position for your strike ball attempt, where has it been recommended by your instructor to position your left instep (right instep for left-hand bowlers) in relationship to the nearest row of dots on floor where you will begin your approach? *Assuming you do not have a proven target arrow on the bowling lane, which arrow has been recommended by your instructor to use as your target for your strike ball? *To throw a hook ball, with your thumb straight up referring to the 12 noon position, at what "time position" should your thumb be positioned? *Which lane arrow is recommended to you as your target for attempting a spare, with the exception of most spares with the 1- or 5-pin? *How many steps in the approach used by most bowlers? *If you are a right-hand bowler using the most common approach, is your first step taken with which foot? 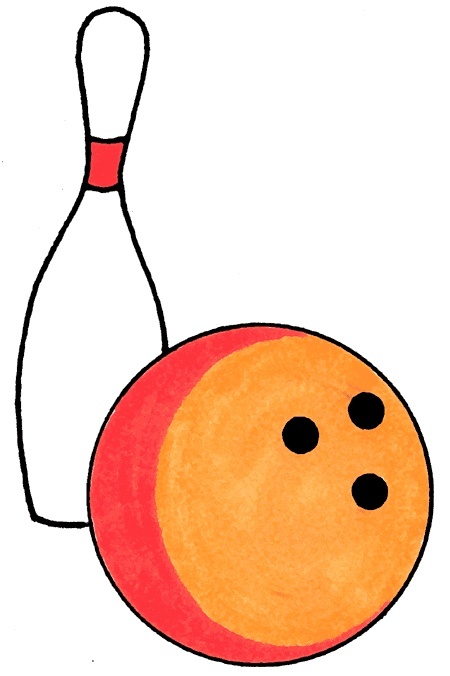 *As you take your first step in a 4-step approach, what do you do with the bowling ball? *At what point of the bowling-arm forward swing is the ball released? *Using the 3-6-9 Method for bowling spares, how many boards would a right-hand bowler move to attempt a spare with only the 3-pin? Would he/she move left or right to attempt this spare? How many boards would a right-hand bowler move to attempt a spare with only the 10-pin? *If you are hitting your target arrow consistently on your strike ball, but you are NOT getting a strike, what should you most likely adjust? *If you keep hitting to the RIGHT of the head pin on your strike ball, in which direction would you adjust your stance? *On a smooth and correct follow-through, what is the final position of the off-side arm? *On a smooth and correct follow-through, what is the final position of the right leg for a right-hand bowler? *Define the following bowling terms: strike, pocket, spare, split, turkey, frame, open frame, handicap scoring, mark, push-away, release, hook ball, scratch bowler, targeting, squaring up, target arrow, spot bowling, pin bowling, slide foot, slide step, drifting. *What is a bowling scoring handicap? Mathematically describe how to figure a bowler's handicap. 1. use the natural hook release and will understand the other styles of deliveries. 2. demonstrate knowledge and understanding of the rules. 3. use correct bowling terminology, etiquette and scoring techniques. 4. demonstrate an interest in improvement through participation and proper use of practice time. 5. show a basic understanding of skill fundamentals, errors and error correction. 6. hit the appropriate target arrow 11 out of 20 attempts, 55% success rate. 1. Instruction in history, terminology, rules, drills, safety and etiquette through lecture, demonstration, discussion and the use of audio-visual aids. 3. Instruction and practice in scoring. a. There is an additional fee billed to your account, which goes to MU Lanes to pay the students working the desk and help with maintenance and equipment costs. It also will allow you to bowl one free line sometime after the 3rd week of the term. This will be explained in class. b. The PAC fee has already been billed to your account. c. Refunds of fees if you drop or withdraw follow the University fee refund schedule found in the Registration Information Handbook. d. Clothes that allow you to move and socks. 3. There is a handout of information on Blackboard. Please access this for important information and to study for the quizzes. Please, no eating during class. If you bring a drink to class, please keep it off of the scoring table and deposit the empty container properly after class. Also, please return your ball and shoes to their proper places each day. Thank you. 1. Turn in the score sheet with at least 2 lines scored. Also, indicate on the back when, where, and with whom you bowled, and comment on the facility and your performance. Bowling additional games during the class time is not considered a make-up. You may use your ‘free’ line (game) for this, but you must turn in 2 lines for a full make up. 2. Watch professional bowling on television for at least 45 minutes and turn in or e/mail a one page synopsis of what you observed. In addition to discussing the tournament, include documentation affirming that you actually watched. (when, channel, how long, tournament, bowlers' names). 3. Go on-line and review a bowling technique Website. Write a page describing what was covered and what you learned. Be sure to include the URL. 4. Another option for a make up is to go to a private bowling center and observe league bowling for 45 minutes. For credit you must e/mail me a written synopsis of what you observed including day, time, place, and your comments sufficient to earn participation points equal to class. and please include the word "fishing" in the subject line of your email so your important note is not screened out by the spam filter. Please cut and paste this email addressgorman_flyfishing@hotmail.comPlease include the word "fishing"